Left Right Left is social and political thriller. The movie is directed by Arun Kumar Aravind and is penned by Murali Gopi. Indrajith, Murali Gopi, Ramya Nambeeshan, Lena and Hareesh Peradi are the leading actors of the movie. Left Right Left is getting a warm reception from the audience after the deep impact of it's promo trailers and songs in YouTube and other media. This is a review of Left Right Left. Left Right Left, one of the most awaited Malayalam movie of the Monsoon season, has come up with a big bang. The combo of Arun Kumar Aravind, Murali Gopi, Indrajith and Lena did not disappoint the anticipation of the fans again. Left Right Left is a political movie thriller which takes us through the current state of Communism in our society, pointing it's other side. The movie is getting a warm reception all over. Both audience and critics rate it as an outstanding social and political thriller relevant to the current circumstances. Left Right Left is the story of some random characters from our society. These characters have to go through different circumstances in their early life and how does that mold them up as individuals of various visions and thoughts, is very well shown in this movie. Later they influence one another based on the circumstance in front of them and finally giving some unexpected events. Left Right Left tells the story of three people- a Police officer, a teacher and a communist who carries some hard feelings. Indrajith acts as a brute Police Officer in the movie. Murali Gopi as the teacher, who is physically disabled from an earlier incident. Hareesh Peradi, a not much known actor, has also done well in the movie as the communist with a strong heart. Lena's character is a teacher and she is the wife of Murali Gopi in the movie. Remya Nambeeshan completes the lead acting line up with a fine performance as a nurse. Arun Kumar Aravind, the director of Ee Adutha Kalath and Cocktail, proved once again that he is an upcoming gem in Mollywood. 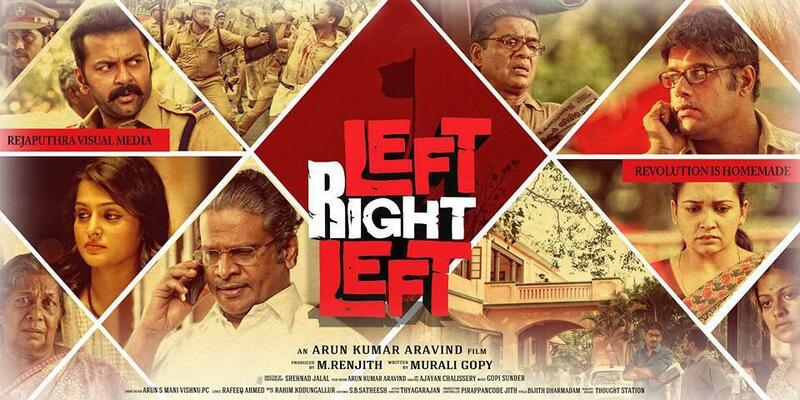 Left Right Left has come with almost the same casting as in Ee Adutha Kalath. Left Right Left is well above Ee Adutha Kalath although they have some similarities in the narration style and in the people behind it. The entire cast has done a superb work, especially the lead actors Indrajith, Murali Gopi, Hareesh Peradi, Lena and Remya Nambeeshan. Murali Gopi's script is outstanding. He has come up with a new way of story telling where there is not start or end. He has successfully penned all the characters and the events happened in their life in the movie Left Right Left. Murali Gopi is becoming one of the highly demanded script writer in the industry. His next movie is Lucifer for Mohanlal. Technical aspects of the movie are good. Gopi Sundar has given a fine touch to the movie with his Music and back ground score. Cinematography by Shehnad Jelal is also superb. The narration is bit slow, which may be hard to digest for some of the audience. Left Right Left is not a movie taken to entertain the whole audience, it is serious movie portraying a serious subject which is relevant to the current social set up. A good movie doesn't have to be super fast, so is Left Right Left. Left Right Left came with the tagline as Revolution is homemade. The movie never deviated from it's tagline and all the incidents and characters in the movie always reminded this. Yes, Revolution is Homemade.